Sky Watch Ni were tasked by the Police Service of Northern Ireland to attend a search on the River Foyle on Saturday 11th February 2017 to assist in the search for a missing 23 year old. A team of four responded and initially completed a search of the reed beds from Granshna Park area. 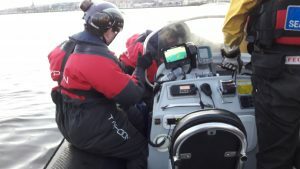 They then returned to Foyle Rescues Head Quarters to view the footage and then deployed on one of their boats to check and rule out some items on the video tape. We would like to thank Foyle Rescue for assisting us to get to the more inaccessible areas.